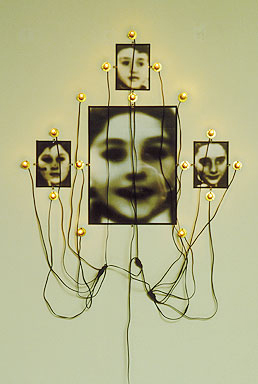 Unlike many of the artists who have so far been featured in this series, Christine Wilks can be understood as a writer of fictions and memoir rather than a poet, or at least an “experimental” poet engaging in the traditions of concrete and visual poetics so prevalent in electronic literature. Her works, while highly interactive, have the ambitions of short films — the sound, image, and text choreography is seamless and absorbing — and though one often reads quite a bit when engaged with them, recorded voices and illustration often predominate. Works of hers such as “Fitting the Pattern” and “Tailspin” engage the reader in the piecing together of narrative, the former involving her mother’s practice as a dressmaker (one literally weaves the story together), the latter a fiction about the tension between an aging man and his daughter as he progressively loses his hearing but refuses treatment. “Underbelly,” which won the New Media Writing Prize at Poole Literary Festival, employs video, dense overlays of audio, video game elements, as well as cryptic glyphs to animate a portrait of a woman sculptor as she uncovers the archetypal form at the heart of a hunk of stone while also traversing the submerged symbolic universe of her own psyche. 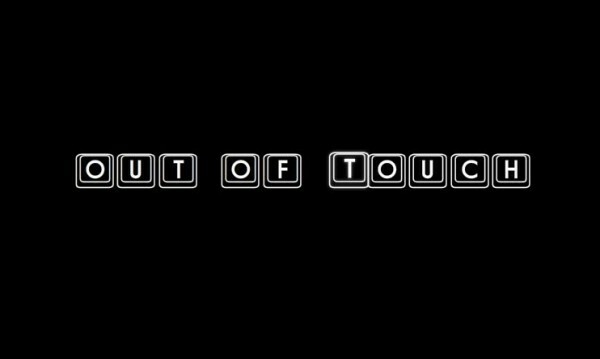 “Out of Touch” reminds me of a very early piece of internet poetry by the graphic designer Juliet Martin called “oooxxxooo,” which was constructed entirely in HTML using the Courier font in shades of white and gray (with classic blue for the links) on a black background, and which took as its subject the apparently desperate need of the artist-protagonist for the computer to ameliorate her loneliness. Martin created some unique linguistic sculpture out of these reduced elements — even in the late ’90s, creating a piece of art out of Courier font, the very internet typeface designers were wont to avoid, seemed radical — with the image often extending off the screen, requiring the use of scroll bars to reach the next link (what Scott McCloud, in the context of digital comix, would call the “infinite canvas“). The cryptic nature of the interface, in which one often returned to phrases already encountered, augmented the sense of futility in deriving basic human comforts from rooting among image, code, and text (I’m feeling a bit of this right now). The primary motif was, perhaps obviously, an apple — or an Apple — from which she had already taken a naughty byte. Wilks’s new piece, also limited to a black-and-white palette, updates this basic idea to the era of Facebook, wifi, and much more easily accessible multimedia software. Ironically, “Out of Touch” has no interactivity — much the fetish of early digital writers — perhaps because, in Web 2.0 culture, even a music video or “gotcha” political snippet is “interactive” simply due to our ability to post it to our blog, “like” it on Facebook, view it on a thousand platforms including cellphones, or download and manipulate it on our computers. Her use of video, particularly the manipulations that reduce reality to iconic or cartoon-like (which I read as linguistic) simplicity, accentuates some of the horror at the base of this piece, which has a quasi-Expressionist element — I can’t help but see echoes of “The Scream” in here, or perhaps, with a very different valence in relation to time and experience (it doesn’t happen in Wilks’s piece), the blurred faces in the work of Christian Boltanski. 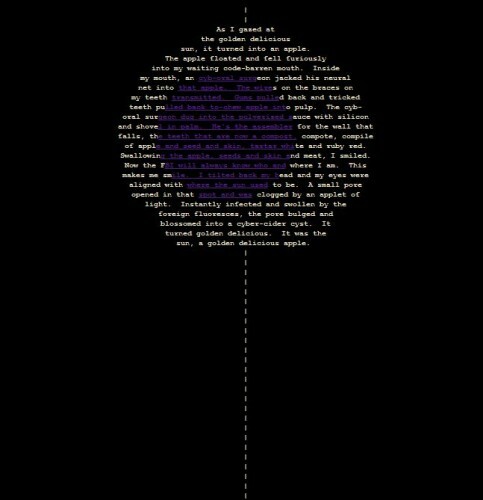 Christine Wilks is a British writer and artist who creates electronic literature and digital artworks for the web at crissxross.net, and engages in collaborative remixing at remixworx.net. Her playable media fiction, “Underbelly,” won the MaMSIE Digital Media Competition 2011 and the New Media Writing Prize 2010. Her work is published in online journals and anthologies, including the Electronic Literature Collection, Volume 2 and Hyperrhiz, issue 08. She has presented her works of e-literature at international festivals, conferences, and live literature and arts events. She has a master’s degree in creative writing and new media, and another in fine art. She is creative director of Make It Happen, e-learning specialists for nonprofit organizations.